I am a big fan of the Atari game Gauntlet. When it finally was ported to the CPC in 1988 I used to play it for hours - unfortunately the first Gauntlet game had a broken level on the original disc so that it crashed every now and then. But Gauntlet II didn't have this error and had some more new features. So I once actually tried to figure out what happens after your reach level 99... but then I didn't really want to spend the time to explore what happens after level 999! As usual with things I like I wanted to copy it! I knew I couldn't do it much better than the programmers at US Gold (who did the original CPC conversion), but somehow I was still determined to create a Gauntlet version of my own. I think the idea of animating dozens of enemies at the same time was interesting to me and therefore I wanted to figure out if I can do it. I also wanted to include a dragon in my conversion, since the dragon in either CPC versions of Gauntlet was missing. 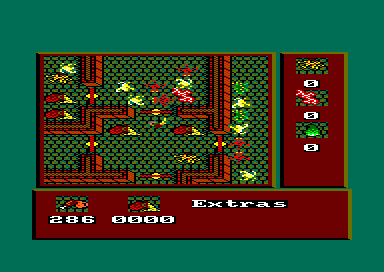 (I've found that out after playing Gauntlet on an Atari ST where there actually were dragons in some levels). I think I even started the game by drawing the dragon. But besides the dragon the graphics is rather sloppy - I'm not a graphics artist, I'm a programmer. And I had a lot to program in this game, so I rather kept to this side of the game. "Die Höhlen von Horwar" was actually one of the first games I've created that were almost completely written in Assembler. So this was quite an achievement for me. I intended this game to get published on the cover disc of one of the two German CPC magazines and so I gave it a German name and entered some German scroll text into it. The game didn't have a name right till the end and the one I finally came up for isn't really this good. I didn't really want to think about this any longer since I wanted to get the game published soon. 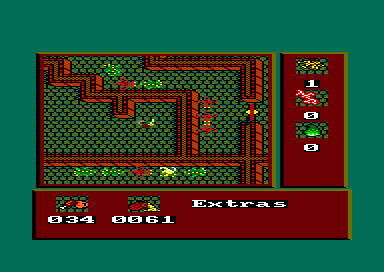 The first version I've sent to the "CPC Magazin" had a bug in it, so that the enemies weren't really erased from the screen once they got hit, but left some weird bytes on the screen. When I found that out I fixed it and sent it back to the "CPC Magazin" not realizing that I created a new bug by fixing the old one. 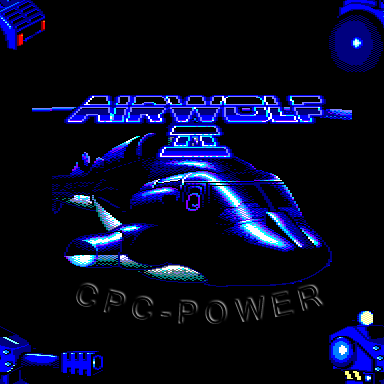 When I finally send in the third version I got a message back that the magazine was cancelled and that they wish me luck to get the game published in the last remaining CPC magazine called "CPC International". Anyway, I still like it and I think it was a good game. I learned a lot from creating it so had my lesson learned. As usual I also created an editor for the game. It was quite a piece of work. 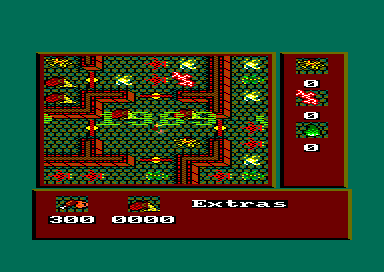 Besides being able to create the levels with the original graphics from the game there was an overview mode in which you can see the whole level with reduced graphics. You can create the levels in boths views, but I mostly used the overview display, because it was a lot faster to paint the levels. For creating the details (like matching the correct wall pieces with one another) I often switched back to the detailed view then. But it was fun anyway and I liked the level editor a lot. But I was only able to create four levels, so that the game wouldn't get too long. 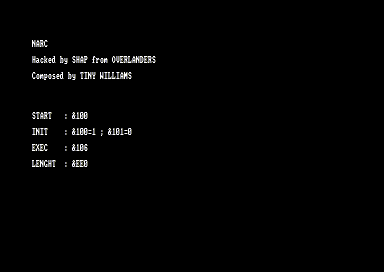 Even though a level just needed two kilobytes (imagine how much memory the levels in todays game take up ... :-). Unfortunately the version on the DSK file lacks level 4. I had a read error on the disc and wasn't able to copy it to the PC. So you cannot really play the whole game anymore, after level 3 it will end with "file not found error" - but if you want to you can create a final level [level 3 (it starts with level 0)], save it to the disc and finish the game. The story of the game is pretty easy. You just have to look around (the character can be controlled with the joystick), collect everything in your way, kill all enemies and find the exit to the next level. Sometimes there are treasures, food or power ups hidden somewhere. You can activate a super bomb with the SPACE key. The other extras affect the power of your shots or add to your life energy.